- Directed by John Sayles. 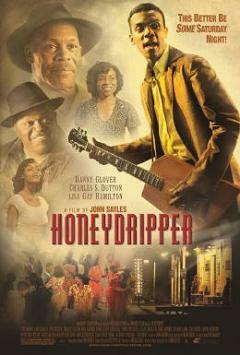 In Alabama during the 1950’s, Tyrone (Danny Glover), the owner of The Honeydripper Lounge, owes money a liquor salesman, a chicken salesman and, most importantly, his landlord. When a famous musician, Guitar Sam, fails to show up for an upcoming concert at The Honeydripper, Tyrone relies on the musical talents of a young, aspiring musician, Sonny (Gary Clark Jr.) to save the club. Danny Glover and Gary Clark Jr. both give convincing performances and the characters they play are likable and well-developed. However, writer/director John Sayles leaves too much of the thin plot stuck in the first act for at least an hour and a half of the two-hour running time. Some of the slow paced scenes help to provide some atmosphere and allow you to absorb the location, which is very much like a character in-and-of-itself. Unfortunately, not enough happens to hold your attention until much later in the second act. The romance between Sonny and Tyrone’s daughter (Yaya DaCosta) feels contrived and doesn’t go anywhere interesting. It’s too bad that a story that could have been so powerful, absorbing and uplifting just has a few hints of moments, but too often feels underwhelming and dull. Number of times I checked my watch: 12. Entertainment Value: Low. Spiritual Value: Low. Released by Emerging Pictures. Opens at Cinema Village. - Directed by Juan Antonio Bayona. In Spanish with subtitles. Laura (Belén Rueda) moves into her childhood home with her son, Simón (Roger Príncep), and husband, Carlos (Fernando Cayo). Simón, who claims to have an invisible friend, mysteriously disappears. When Laura hears all sorts of creepy sounds in the house and sees strange visions, she seeks the help of a paranormal investigator, Aurora (Geraldine Chaplin), to determine if any of the ghosts happen to Simón. Decent performances, especially by Belén Rueda, barely make up for a weak story. Screenwriter Sergio G. Sánchez combines the genres of drama, fantasy, mystery and horror with mixed results because there’s simply not enough of each to keep you thrilled or engrossed in the story. Also, director Juan Antonio Bayon paces some scenes much slower than others and includes awkward transitions, which distracts from the plot’s overall momentum. The details of the mystery take a while to make more sense and be fun to figure out after a second act that goes around in circles without any real surprises. 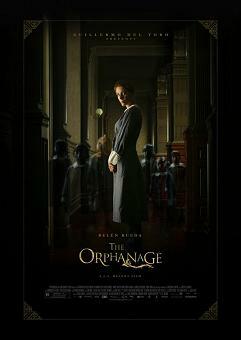 For those who’ve seen superior films like The Others, Poltergeist, The Innocents or even The Devil’s Backbone, The Orphanage will ultimately seem like treaded water. Number of times I checked my watch: 2. Entertainment Value: Moderate. Spiritual Value: None, as long as you suspend your disbelief. Released by Picturehouse. Opens at Loews Lincoln Square, AMC Empire 25 and Landmark Sunshine Cinema.